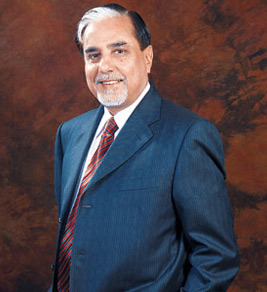 Mr. Subhash Chandra, Chairman of Zee Entertainment Enterprises Limited (ZEE) and promoter of the Essel Group of Companies is among the leading lights of the Indian industry. A self-made man, Mr. Chandra has consistently demonstrated his ability to identify new businesses and lead them on the path to success. Mr. Chandra who is referred to as the Media Moghul of India, revolutionised the television industry by launching the country’s first satellite Hindi channel Zee TV in 1992 and later the first private news channel, Zee News. The ZEE Network today has over 670+ million viewers in 169 countries. His bouquet of businesses includes television networks (ZEE), a newspaper chain (DNA), cable systems (Wire and Wireless Ltd), direct-to-home (Dish TV), satellite communications (Agrani and Procall), theme parks (EsselWorld and Water Kingdom), online gaming (Playwin), education (Zee Learn), flexible packaging (Essel Propack), infrastructure development (Essel Infraprojects Ltd) and family entertainment centres (Fun Cinemas). Credited with tremendous business astuteness, Mr Chandra has charted a course of growth and success, unparalleled in business history. All of Mr Chandra's ventures are path-breaking in nature, be it the Essel Propack, which is the largest speciality packaging company in the world; Asia’s largest amusement park Essel World; or the first satellite television in India (Zee TV). Mr Chandra has made his mark as an influential philanthropist in India. He has set up TALEEM (Transnational Alternate Learning for Emancipation and Empowerment through Multimedia) to provide access to quality education through distance and open learning. He is also the Chairman of the Ekal Vidyalaya Foundation of India — a movement to eradicate illiteracy from rural and tribal India. The Foundation provides free education to nearly 10,35,444 (1 million +) tribal children across 36,783 villages through one-teacher schools. He is the moving force behind the Global Vipassana Foundation — a trust set up to help people raise their spiritual quotient. Mr Chandra is also the Founder Chairman of Global Foundation for Civilization Harmony (India) (GFCH), an Eastern initiative for conflict avoidance and a partner of the United Nations Alliance of Civilization (UNAOC). The founder patrons of GFCH include His Holiness Dalai Lama and former President of India Dr. A.P.J. Abdul Kalam, among others. As a firm believer in the concept of Karma, his actions are not performed with a selfish motive. He believes that the key to happiness is to take success in your stride and not be depressed when you fail. Just keep doing your Karma, is his mantra. A true Karmayogi indeed.